This article is about the airport. For the future Washington Metro station that will serve the airport beginning in 2020, see Dulles International Airport station. Not to be confused with Dallas/Fort Worth International Airport. Washington Dulles International Airport (/ˈdʌlɪs/ DUL-iss) (IATA: IAD, ICAO: KIAD, FAA LID: IAD) is an international airport in the eastern United States, located in Loudoun and Fairfax counties in Virginia, 26 miles (42 km) west of downtown Washington, D.C. Opened in 1962, it is named after John Foster Dulles (1888–1959), the 52nd Secretary of State who served under President Dwight D. Eisenhower. 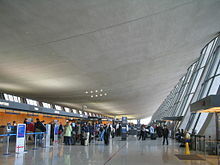 The Dulles main terminal is a well-known landmark designed by Eero Saarinen. Operated by the Metropolitan Washington Airports Authority, Dulles Airport occupies 13,000 acres (20.3 sq mi; 52.6 km2) straddling the Loudoun-Fairfax line. Most of the airport is in the unincorporated community of Dulles in Loudoun County, with a small portion in the unincorporated community of Chantilly in Fairfax County. The airport serves the Washington metropolitan area. Dulles is one of the three major airports in the larger Baltimore–Washington metropolitan area with more than 21 million passengers a year. Dulles has the most international passenger traffic of any airport in the Mid-Atlantic outside the New York metropolitan area, including approximately 90% of the international passenger traffic in the Baltimore-Washington region. On a typical day, more than 60,000 passengers pass through Dulles to and from more than 125 destinations around the world. Dulles Airport in 2018 surpassed Ronald Reagan Washington National Airport (DCA) in yearly passenger boardings after having fewer passengers ever since 2015. However, Dulles Airport still ranks behind Baltimore–Washington International Airport (BWI) in total annual passenger boardings, despite being a larger facility with more gates. Prior to World War II, Hoover Field was the main commercial airport serving Washington, on the site now occupied by The Pentagon and its parking lots. It was replaced by Washington National Airport in 1941, a short distance southeast. After the war, in 1948, the Civil Aeronautics Administration began to consider sites for a second major airport to serve the nation's capital. Congress passed the Washington Airport Act in 1950 to provide funding for a new airport in the region. The initial CAA proposal in 1951 called for the airport to be built in Fairfax County near what is now Burke Lake Park, but protests from residents, as well as the rapid expansion of Washington's suburbs during the time, led to reconsideration of this plan. One competing plan called for the airport to be built in the Pender area of Fairfax County, while another called for the conversion of Andrews Air Force Base in Prince George's County, Maryland into an airport. The current site was selected by President Eisenhower in 1958; the Dulles name was chosen by Eisenhower's aviation advisor Pete Quesada, who later served as the first head of the Federal Aviation Administration. As a result of the site selection, the unincorporated, largely African-American community of Willard, which once stood in the airport's current footprint, was demolished, and 87 property owners had their holdings condemned. The civil engineering firm Ammann and Whitney was named lead contractor. The airport was dedicated by President John F. Kennedy and Eisenhower on November 17, 1962. As originally opened, the airport had three runways (current day runways 1C/19C, 1R/19L, and 12/30). Its original name, Dulles International Airport, was changed in 1984 to Washington Dulles International Airport. The main terminal was designed in 1958 by famed Finnish-American architect Eero Saarinen, and it is highly regarded for its graceful beauty, suggestive of flight. In the 1990s, the main terminal at Dulles was reconfigured to allow more space between the front of the building and the ticket counters. Additions at both ends of the main terminal more than doubled the structure's length. The original terminal at Taiwan Taoyuan International Airport in Taoyuan, Taiwan was modeled after the Saarinen terminal at Dulles. The design included a landscaped man-made lake to collect rainwater, a low-rise hotel, and a row of office buildings along the north side of the main parking lot. The design also included a two-level road in front of the terminal to separate arrival and departure traffic and a federally owned limited access highway connecting the terminal to the Capital Beltway (I-495) about 17 miles (27 km) to the east. (Eventually, the highway system grew to include a parallel toll road to handle commuter traffic and an extension to connect to I-66). The access road had a wide median strip to allow the construction of a passenger rail line, which will be in the form of an extension of the Washington Metro's Silver Line and is expected to be completed in 2020. The first scheduled flight at Dulles was an Eastern Air Lines Super Electra from Newark International Airport in New Jersey on November 19, 1962. Dulles was initially considered a white elephant, being far out of town with few flights; in 1965 Dulles averaged 89 airline operations a day while National Airport (now Reagan) averaged 600 despite not allowing jets. (Dulles got its first transatlantic nonstop in June 1964.) Airport operations grew along with Virginia suburbs and the Dulles Technology Corridor; perimeter and slot restrictions at National forced long-distance flights to use Dulles. In 1969, Dulles had 2.01 million passengers while National had 9.9 million. The era of jumbo jets began on January 15, 1970 when First Lady Pat Nixon christened a Pan Am Boeing 747 at Dulles in the presence of Pan Am chairman Najeeb Halaby. Rather than a traditional champagne bottle, red, white, and blue water was sprayed on the aircraft. Pan Am's first Boeing 747 flight was from New York JFK to London Heathrow Airport. On May 24, 1976 supersonic flights between the U.S. and Europe began with the arrival of a British Airways Concorde from London and an Air France Concorde from Paris. The two were lined nose-to-nose at Dulles for photos. On June 12, 1983 the Space Shuttle Enterprise arrived at Dulles atop a modified Boeing 747 after touring Europe and before returning to Edwards Air Force Base. Two years later Enterprise returned and was placed in a storage hangar near Runway 12/30 to await construction of a planned expansion to the National Air and Space Museum. Enterprise left Dulles on April 27, 2012, for its new home at the Intrepid Sea, Air & Space Museum in New York City. In 1990 a United States Senate joint resolution to change Dulles's name to Washington Eisenhower was proposed by Senator Bob Dole, but it didn't pass. When the SR-71 was retired by the military in 1990, one was flown from its birthplace at United States Air Force Plant 42 in Palmdale, California to Dulles, setting a coast-to-coast speed record at an average 2,124 mph (3,418 km/h). The trip took 64 minutes. The aircraft was placed in a storage building to await display. The first flight of the Boeing 777-200 in commercial service, a United Airlines flight from London Heathrow, landed at Dulles in 1995. The 2004 launch of low-cost carrier Independence Air propelled IAD from being the 24th-busiest airport in the United States to fourth, and one of the top 30 busiest in the world. Independence Air ceased operations in January 2006, and its space in Concourse A was taken five months later by United Express. Southwest Airlines began service at Dulles in Fall 2006. In 2007, 24.7 million passengers passed through the airport. On November 20, 2008, a third parallel north–south runway opened on the west side of the airfield, designated 1L/19R. The original 1L/19R was redesignated 1C/19C. It was the first new runway to be built at Dulles since the airport's construction. On June 6, 2011, the airport received its first Airbus A380 flights when Air France introduced the A380 on its nonstop from Paris Charles de Gaulle Airport. On April 17, 2012, the Space Shuttle Discovery was ferried to Dulles mounted to a NASA 747-100 as part of its decommissioning and installation in the Steven F. Udvar-Hazy Center. On June 1, 2012, the first passenger flight of the Boeing 747-8 Intercontinental landed as a Lufthansa service from Frankfurt Airport. On August 15, 2012, Ethiopian Airlines Boeing 787 Dreamliner arrived at Dulles. It was Ethiopian Airlines first 787 & the first 787 received by an African carrier. On October 2, 2014, British Airways began using the Airbus A380 on flights from London Heathrow Airport to Washington Dulles. However, it has ended A380 flights, reverting to a 747-400. On February 1, 2016, Emirates upgraded its direct flights from Dubai International (previously a Boeing 777) to an Airbus A380. As of 2019[update], Dulles is only one of ten airports in the United States that sees daily operations from, and/or has a gate to accommodate an Airbus A380; the others being Los Angeles-LAX, San Francisco-SFO, New York–JFK, Atlanta-Hartsfield, Dallas/Fort Worth, Houston-Intercontinental, Miami, Boston and Chicago-O'Hare. On May 16, 2018, Volaris Costa Rica launched flights to Dulles becoming the first international low-cost carrier to serve the airport. By the 1980s the original design, featuring mobile lounges to meet each plane, was no longer well-suited to Dulles' role as a hub airport. Instead, midfield concourses were added to allow passengers to walk between connecting flights without visiting the main terminal. Mobile lounges were still used for international flights and to transport passengers between the midfield concourses and the main terminal. An underground tunnel (consisting of a passenger walkway and moving sidewalks) which links the main terminal and Concourse B was opened in 2004. The Metropolitan Washington Airports Authority (MWAA) began a renovation program for the airport including a new security mezzanine with more room for lines. A new train system, dubbed AeroTrain and developed by Mitsubishi, began in 2010 to transport passengers between the concourses and the main terminal. The system, which uses rubber tires and travels along a fixed underground guideway, is similar to the people mover systems at Singapore Changi Airport, Hartsfield–Jackson Atlanta International Airport, and Denver International Airport. The train is intended to replace the mobile lounges, which many passengers found crowded and inconvenient. The initial phase includes the main terminal station, a permanent Concourse A station, a permanent Concourse B station, a permanent midfield concourse station (with access to the current temporary C concourse via a tunnel with moving walkways), and a maintenance facility. Mobile lounges continue to service the D Concourse from both the main terminal and Concourse A. Even after AeroTrain is built out and the replacement Concourses C and D are built, the mobile lounges and plane mates will still continue to be used, to transport international arriving passengers to the International Arrivals Building, as well as transport passengers to aircraft parked on hardstands without direct access to jet bridges. Dulles has stated that the wait time for a train does not exceed four minutes, compared to the average 15-minute wait and travel time for mobile lounges. Under the development plan, future phases would see the addition of several new midfield concourses and a new south terminal. A fourth runway (parallel to the existing runways 1 and 19 L&R) opened in 2008, and development plans include a fifth runway to parallel the existing runway 12–30. If this runway is built, the current runway will be redesignated as 12L-30R while the new runway will be designated 12R-30L. An expansion of the B concourse, used by many low-cost airlines as well as international arrivals, has been completed, and the building housing Concourses C and D will eventually be knocked down to make room for a more ergonomic building. Because Concourses C and D are temporary concourses, the only way to get to those concourses is via moving walkway from the Concourse C station which is built in the location of the future gates and Concourse D by mobile lounge from the main terminal. Short term, United Airlines plans to build a 20,000 square feet build out from Concourse C between gate C18 and the aerotrain entrance that will contain a new Polaris Lounge for international passengers. Dulles originally used airport code DIA, the initials of Dulles International Airport. When handwritten, it was often misread as DCA, the code for Ronald Reagan Washington National Airport, so in 1968 Dulles' code was changed to IAD. The airport's terminal complex consists of a main terminal and two midfield terminal buildings: Concourses A/B and C/D. The entire terminal complex has 123 gates and 16 hardstand locations from which passengers can board or disembark using the airport's plane mate vehicles. Conceived in early planning sessions in 1959, Dulles is one of the few remaining airports to use the mobile lounge (also known as "plane mates" or "people movers") now only used for transport to the International Arrivals Building as well as transport for Concourse D. They have all been given names based on the postal abbreviations of 50 states, e.g., VA, MD, AK. 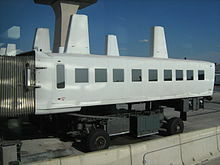 The Metropolitan Washington Airports Authority has gradually phased out the mobile lounge system for inter-terminal passenger movements in favor of the AeroTrain, an underground people mover which currently operates to all of the concourses except Concourse D, with passenger tunnels remaining to concourses A and B. Plane mates remain in use to disembark international passengers and carry them to the International Arrivals Building, as well as to convey passengers to and from aircraft on hard stand (i.e., those parked remotely on the apron without access to jet bridges). The terminal ceiling is suspended in a catenary curve above the luggage check-in area. Dulles's iconic main terminal houses ticketing, baggage claim, U.S. Customs and Border Protection, an international arrivals building for passenger processing, the Z gates, information facilities and other support facilities. The terminal was recognized by the American Institute of Architects in 1966 for its design concept; its roof is a suspended catenary providing a wide enclosed area unimpeded by any columns. The main terminal was extended in 1996 to 1,240 feet (380 m)—Saarinen's original design length—which was slightly more than double its originally constructed length of 600 feet (180 m). In addition, an extension for international arrivals was added to the west of the main terminal in 1991. On September 22, 2009, an expansion of the international arrivals building opened which includes a 41,400 square feet (3,850 m2) arrival hall for customs and immigration processing. The new facility has the capacity to process 2,400 arriving passengers per hour. Also in September 2009, a 121,700 square feet (11,310 m2) central security checkpoint was added on a new security mezzanine level of the main terminal. This checkpoint replaced previous checkpoints which were located behind the ticketing areas, however, travellers enrolled in TSA PreCheck and CLEAR still use this area to clear security. A separate security checkpoint is available on the baggage claim level. Both security checkpoints connect to the AeroTrain, which links the main terminal with the A, B, and C concourses. There are two sets of gates in the main terminal: the first is the "H" Gates, which are waiting areas for airlines which lack permanent physical jetbridges and therefore use plane mates to reach planes parked at 16 hard-stand locations. The other is a set of four gates with jetbridges that are designated as Concourse Z, which provides service for Air Canada Express and Frontier Airlines. All airlines aside from Air Canada Express and Frontier Airlines operate out of two linear satellite terminals. One contains Concourses A and B, and the second contains Concourses C and D.
All non-United flights operate out of these two concourses as well as some United Express flights. Concourse A (which has 47 gates) composes the eastern part of the closest midfield terminal building. It consists of a permanent ground level set of gates designed for small planes and regional jets used by United Express, and several former Concourse B gates. The concourse is primarily used for international flights. Air France operates an airline lounge opposite gate A22, Etihad Airways operates a First and Business Class lounge across from gate A15, and Virgin Atlantic has a Clubhouse lounge across from gate A32. Concourse A's AeroTrain station is located about halfway through the concourse, between gates A6 and A14. Concourse B (which has 28 gates) composes the western half of the building. It is the first of the permanent elevated midfield concourses. Originally constructed in 1998 and designed by Skidmore, Owings & Merrill and Hellmuth, Obata and Kassabaum, the B concourse contained 20 gates. In 2003, 4 additional gates were added to concourse B, followed by a 15-gate expansion in 2008. In addition to the AeroTrain station located between gates B51 and B62, Concourse B also has an underground walkway to connect it to the main terminal. Concourse B is used by some international carriers, and is also utilized by all non-United domestic and Canada flights. The facility also includes a British Airways Galleries lounge, a Lufthansa lounge divided into Senator and Business class sections located between gates B49 and B51, and a Turkish Airlines Lounge near gate B43. Concourses C/D are solely used for United Airlines flights. All mainline United flights and most United Express regional jet operations operate out of these concourses (some United Express flights use Concourse A). These concourses were constructed in 1983 and designed by Hellmuth, Obata and Kassabaum. The two concourses have 22 gates each, numbered C1-C28 and D1-D32, with odd-numbered gates on the north side of the building and even numbered gates on the south side. Concourse C composes the eastern half of the terminal and Concourse D composes the gates on the west half of the terminal. The C/D concourses were given a face lift in 2006 which included light fixture upgrades, new paint finishes, new ceiling grids and tiles, heating and air conditioning replacement, and complete restroom renovations. Concourse C also has a dedicated Federal Inspection Station located at ground level. International United flights not originating at an airport with US customs preclearance can directly deplane passengers via jetbridge at Concourse C (as opposed to using plane mates to offload passengers). Once deplaned, arriving passengers are separated. Passengers terminating at Dulles take a mobile lounge that transports them to the International Arrivals Building, while connecting passengers continuing on another United flight go through U.S. Customs and Immigration at the FIS station on the ground level. Since this immigration facility is only for connecting passengers on United and other Star Alliance carriers, it has shorter lines and passengers don't have to reclear security at the massive security checkpoints in the main terminal. The facility houses three United Clubs: one adjacent to Gate C7, one adjacent to gate C17, and one adjacent to gate D8. A United International First Lounge is near gate C2. Concourse C is directly linked to the main terminal via the AeroTrain, while mobile lounges can be used to travel from Concourse D to the main terminal. A new and permanent C/D concourse (also called "Tier 2") is planned as part of the D2 Dulles Development Project. The new building is to include a three-level structure with 44 airline gates and similar amenities to Concourse B. The concourse plan includes a dedicated mezzanine corridor with moving sidewalks to serve international passengers. The design and construction of the new C/D concourse has not been scheduled. When built, it is planned that both terminals will be connected to the main terminal and other concourses via the AeroTrain. To that extent, the AeroTrain station at Concourse C was built at the location where the future Concourse C/D structure is proposed to be built, and is connected to the existing Concourse C via an underground walkway. Air France: Air France Lounge, A Concourse across from gate A22. British Airways: Galleries Club and Galleries First lounges, each with their own separate dining rooms, B Concourse. Etihad Airways: First and Business class lounge located opposite gate A15. Lufthansa: Senator Lounge and Business Lounge, B Concourse at gate B51. United Airlines: Three United Clubs in Concourse C (one of which is the former Global First Lounge) and one in Concourse D. United intends to build a Polaris Club as part of an addition to Concourse C.
All domestic (lower 48) destinations from Washington Dulles International Airport (IAD). ^a : Avianca's flight to La Paz makes a stop at Bogotá. ^b : Ethiopian Airlines' flight from Addis Ababa to Dulles stops at Dublin, but the flight from Dulles to Addis Ababa is nonstop. Along with Newark Liberty International Airport, Dulles is one of United Airlines' two East Coast hubs, with many nonstop flights to Europe, Asia, and South America. As of June 2015, United handled 61.1% of scheduled air carrier passengers at the airport. American Airlines has a 4.8% market share. Delta Air Lines handles 4.1% of scheduled air carrier passengers. In addition, 29 foreign carriers have service in and out of Washington Dulles. On a typical day, Dulles averages 1,000 to 1,200 flight operations. Dulles served 21.6 million passengers in 2014, a 1.7% decrease over 2013. However, international passenger traffic has increased by 1.6% to nearly 7.1 million during the same time. Additional international service is commencing service at Washington Dulles. With 45 weekly flights, Dulles is now the third-largest United States gateway to the Middle East. Even before the United States economic recession started, international passengers have continued to grow, which prompted the Metropolitan Washington Airports Authority to expand the International Arrivals Building to handle 2,400 passengers per hour. Since its opening in November 1962 through the end of 2018, over 646.2 million passengers have flown in and out of Dulles. This includes U.S. and international military passengers from 1962-1988. This is an average of over 11.5 million passengers annually. There have been over 14.9 million aircraft operations since IAD opened, an average of over 266,000 operations annually. Dulles is accessible via the Dulles Access Road/Dulles Greenway (State Route 267) and State Route 28. The Dulles Airport Access Highway (DAAH) is a toll-free, limited access, highway owned by the Metropolitan Washington Airports Authority (MWAA) to facilitate car access to Dulles from the Washington Capital Beltway and Interstate 66. After it opened, non-airport traffic between Washington and Reston became so heavy that a parallel set of toll lanes were added on the same right-of-way to accommodate non-airport traffic (Dulles Toll Road). However, the airport-only lanes are both less congested as well as toll-free. As of November 1, 2008, MWAA assumed responsibility from the Virginia Department of Transportation both for operating the Dulles Toll Road and for the construction of a rapid transit rail line down its median. Route 28, which runs north–south along the eastern edge of the airport, has been upgraded to a limited access highway, with the interchanges financed through a property tax surcharge on nearby business properties. The Dulles Toll Road has been extended to the west to Leesburg as the Dulles Greenway. Fairfax Connector routes 981 and 983 serve Dulles, connecting to the Herndon–Monroe park & ride lot in Herndon, the Reston Town Center transit in Reston, the Wiehle – Reston East Metro station, and the Steven F. Udvar-Hazy Center Air and Space Museum. The "Express" 5A Metrobus route operates service to the airport. The bus stops at the Herndon–Monroe park & ride lot in Herndon and the Rosslyn Metro station in Arlington and terminates at the L'Enfant Plaza Metro station in Southwest DC. Rosslyn can be accessed by the Orange, Blue, and Silver lines, while L'Enfant Plaza is also served by the Yellow and Green lines. Washington Flyer's Silver Line Express bus service operates roughly every 15–20 minutes between the airport and the Wiehle – Reston East Metro station. This service will be permanently discontinued when Phase II of the Silver Line opens in 2020. Passengers connecting to the Shenandoah Valley can use the Shenandoah Valley Commuter Bus, which connects to the Vienna and Rosslyn Metro stations. Washington Flyer has a monopoly to operate cabs from Dulles Airport. SuperShuttle ride sharing vans are also available. Uber and Lyft are popular modes are transport to and from the airport and MWAA receives a $4 fee per trip, which is included in the quoted fare. Construction is underway to connect the airport to Washington, D.C. via the Silver Line of the Washington Metro. While initial plans called for completion of the station in 2016, officials now expect the construction to be completed in 2020. 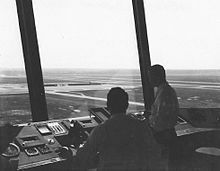 Control Tower view of IAD in 1961. There were three deaths during a nine-day air show held at Dulles in conjunction with Transpo '72 (officially called the U.S. International Transportation Exposition, a $10 million event sponsored by the U.S. Department of Transportation, and attended by over one million visitors from around the world). On May 29, 1972, the third day of the show, the pilot of a Kite Rider (a variety of hang glider) was killed in a crash. This was to be the first of the three air deaths during the Air Show. On June 3, 1972, a second death occurred at the Transpo '72 Air Show, during a sport plane pylon race. At 2:40 pm, during the second lap and near a turn about pylon 3, a trailing aircraft's (LOWERS R-1 N66AN) wing and propeller hit the right wing tip of a leading aircraft (CASSUTT BARTH N7017). The right wing immediately sheared off the fuselage, and the damaged aircraft crashed almost instantly, killing the 29-year-old pilot, Hugh C. Alexander. He was a professional Air Racer with over 10,200 hours. On June 4, 1972, during the last day of the 9-day Transpo '72 Air Show, the U.S. Air Force Thunderbirds experienced their first fatal crash at an air show. Major Joe Howard flying Thunderbird 3 was killed when his F-4E-32-MC Phantom II, 66-0321, lost power during a vertical maneuver. The pilot broke out of formation just after he completed a wedge roll and was ascending at around 2,500 feet AGL. The aircraft staggered and descended in a flat attitude with little forward speed. Although Major Howard ejected as the aircraft fell back to earth from about 1,500 feet (460 m) tail first, and descended under a good canopy, winds blew him into the fireball ascending from the blazing crash site. The parachute melted and the pilot plummeted 200 feet, sustaining fatal injuries. On December 1, 1974, while diverting to Dulles, TWA Flight 514 crashed onto the western slope of Mount Weather. All 85 passengers and 7 crew members were killed on impact. On June 14, 1979, the number 5 and 6 tires on an Air France Concorde blew out during takeoff. Shrapnel thrown from the tires and rims damaged number 2 engine, punctured three fuel tanks, severed several hydraulic lines and electrical wires, in addition to tearing a large hole on the top of the wing, over the wheel well area. On July 21, 1979, one month after the above tire incident, another Air France Concorde blew several of its landing gear tires during takeoff. After that second incident the "French director general of civil aviation issued an air worthiness directive and Air France issued a Technical Information Update, each calling for revised procedures. These included required inspection of each wheel/tire for condition, pressure and temperature prior to each take-off. In addition, crews were advised that landing gear should not be raised when a wheel/tire problem is suspected." On June 18, 1994, a Learjet 25 operated by Mexican carrier TAESA crashed in trees while approaching the airport from the south. Twelve people died. The passengers were planning to attend the 1994 FIFA World Cup soccer games being staged in Washington, D.C.
As part of the September 11th, 2001 attacks, American Airlines Flight 77 was hijacked while en route from Dulles to Los Angeles and flown directly into the Pentagon in Arlington County, Virginia, killing all 64 on board as well as 125 in The Pentagon. ^ "Dulles Air Traffic Statistics". Metropolitan Washington Airports Authority. January 2017. Retrieved April 19, 2017. ^ "Dulles International Airport". Metropolitan Washington Airports Authority. Retrieved December 4, 2010. ^ a b "JFK, Eisenhower dedicated airport". Eugene Register-Guard. (Oregon). Associated Press. November 17, 1962. p. 1A. ^ a b "$110 million Dulles airport is dedicated". Bend Bulletin. (Oregon). UPI. November 17, 1962. p. 1. ^ a b c d "Facts About Washington Dulles International Airport". Metropolitan Washington Airports Authority. Archived from the original on June 23, 2011. Retrieved June 3, 2011. ^ a b c "Washington Dulles International Airport (IAD) Air Traffic Statistics". Metropolitan Washington Airports Authority. 2014. Retrieved March 4, 2015. ^ "Preliminary CY 2012 Enplanements" (PDF). Federal Aviation Administration. 2013. Archived from the original (PDF) on September 3, 2013. Retrieved August 27, 2013. ^ "U.S. International Air Passenger and Freight Statistics Report". Office of the Assistant Secretary for Aviation and International Affairs, U.S. Department of Transportation. Retrieved December 25, 2016. ^ "Air Service Maps – IAD". Metropolitan Washington Airports Authority. Archived from the original on December 16, 2010. Retrieved December 4, 2010. ^ "Dulles International Airport pulled ahead of Reagan National in 2018". WTOP. Retrieved March 9, 2019. ^ a b c Scheel, Eugene. "History of Dulles Airport". Retrieved June 2, 2015. ^ "History of Washington Dulles International Airport". Metropolitan Washington Airports Authority. Retrieved June 2, 2015. ^ a b Greenfield, Heather (November 17, 2002). "'Visionary' Dulles Airport hits 40". The Free Lance-Star. Fredericksburg, Virginia. Associated Press. p. B1. 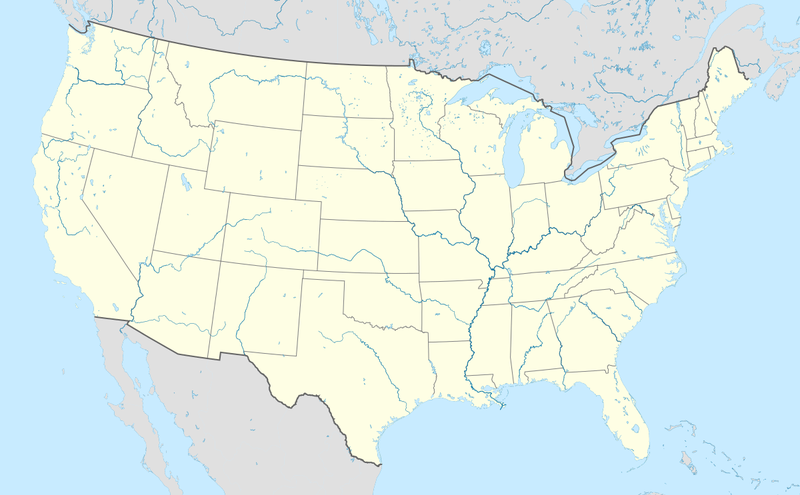 ^ "Abandoned & Little-Known Airfields: Virginia: Loudoun County". www.airfields-freeman.com. Retrieved November 22, 2018. ^ Tom (January 21, 2014). "Opening Dedication Ceremony of Dulles Airport in 1962". Ghosts of DC. Retrieved February 17, 2019. ^ "History of Washington Dulles International Airport". Metropolitan Washington Airports Authority. Retrieved December 4, 2010. ^ Davis, J.W. (April 17, 1966). "Dulles Airport: Its future keeps being postponed". Eugene Register-Guard. Oregon. p. 10A. ^ "President's wife christens giant jet". Eugene Register-Guard. (Oregon). Associated Press. January 15, 1970. p. 5A. ^ "Pat christens plane". Pittsburgh Press. UPI photo. January 15, 1970. p. 1. ^ "2 Concordes zip supersonic travel age into U.S." Pittsburgh Press. UPI. May 24, 1976. p. 1. ^ "Concorde lands in U.S." Spokesman-Review. (Spokane, Washington). (AP photo). May 25, 1976. p. 1. ^ Tom (January 30, 2012). "First Commercial Concorde Flight Lands at Dulles". Ghosts of DC. Retrieved February 17, 2019. ^ "Space Shuttle Pavilion". IntrepidMuseum.org. Archived from the original on April 15, 2011. Retrieved December 24, 2013. ^ "Tribute to Eisenhower". The New York Times. Reuters. January 25, 1990. Retrieved June 3, 2011. see also, 101st Congress, S.J.RES.239. ^ "Blackbird Records". SR-71 Online. Retrieved June 3, 2011. ^ "United Airlines". Century-of-flight.net. Retrieved June 3, 2011. ^ "United Express moves to Concourse A at Dulles International Airport". United.com. Archived from the original on April 24, 2006. Retrieved June 3, 2011. ^ Coombs, Joe (February 7, 2008). "Passenger numbers up at Dulles International, Reagan National airports". Washington Business Journal. Retrieved April 6, 2008. ^ Tom (June 13, 2012). "Space Shuttle Discovery Flies Over Washington". Ghosts of DC. Retrieved February 17, 2019. ^ Lufthansa starts 747-8 flights to Dulles - Washington Business Journal. Bizjournals.com (2012-06-01). Retrieved on 2013-08-16. ^ Ethiopian Airlines Inaugurates 787 Dreamliner Airplane at Washington Dulles International Airport. ET African Journeys (2012-08-17). Retrieved on 2013-08-16. ^ Pallini, Thomas (May 17, 2018). "Volaris Costa Rica Inaugurates Washington Route, Marks New Chapter for Dulles". Airline Geeks. Retrieved July 30, 2018. ^ "Cathay Pacific to launch Washington DC service with the Airbus A350-1000". ^ "Passenger Walkway to Concourses A and B Fact Sheet" (PDF). Metropolitan Washington Airports Authority. 2009. Archived from the original (PDF) on January 5, 2011. Retrieved October 12, 2010. ^ "Dulles Development: Main Terminal Improvement Fact Sheet" (PDF). Metropolitan Washington Airports Authority. 2009. Archived from the original (PDF) on January 5, 2011. Retrieved October 12, 2010. ^ a b c d "Aerotrain – How the System Works" (PDF). Metropolitan Washington Airports Authority. Retrieved September 14, 2015. ^ Weiss, Eric M. (August 19, 2008). "Dulles Updates Its People Movers". The Washington Post. Retrieved October 12, 2010. ^ "D2 Projects: Fourth Runway". Metropolitan Washington Airport Authority. 2009. Archived from the original on September 29, 2010. Retrieved October 12, 2010. ^ "D2 Projects: Future Fifth Runway". Metropolitan Washington Airport Authority. 2009. Archived from the original on September 30, 2010. Retrieved October 12, 2010. ^ Fox, Peggy (January 25, 2010). 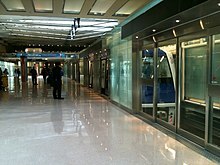 "Dulles Airport To Open AeroTrain". 9 News Now. WUSA. Retrieved October 12, 2010. ^ Russell, Edward (December 10, 2018). "United to invest at least $34m at Washington Dulles". Flight Global. Retrieved December 16, 2018. ^ Crohn, Nick; Fisher, Lynn. "LAX. IAD. ARN. WTF? The strange stories behind airports' three-letter abbreviations". Slate. Slate Group. Retrieved June 25, 2018. ^ a b "Facts About Washington Dulles International Airport". Metropolitan Washington Airports Authority. 2010. Archived from the original on January 29, 2013. Retrieved October 12, 2010. ^ Komons, Nick (August 1, 1989). "Air Progress". Air Progress: 65. ^ Aryanpur, Arianne (February 2, 2006). "At Dulles, The Tarmac Is Their Turf". The Washington Post. p. VA16. Retrieved September 1, 2008. ^ Miroff, Nick (September 14, 2006). "Airport's Future Is on Rails". The Washington Post. p. B01. Retrieved September 1, 2008. ^ Freeman, Sholnn (September 22, 2009). "Elbow Room Expands for International Arrivals". The Washington Post. p. B2. ^ "New Passenger Security Screening Areas Open at Dulles International Airport Tomorrow" (PDF). Metropolitan Washington Airport Authority Office of Public Affairs. September 14, 2009. Retrieved October 12, 2010. ^ "Security Information". Metropolitan Washington Airports Authority. July 2, 2015. Retrieved September 28, 2018. ^ "Aerotrain has Opened". Metropolitan Washington Airport Authority. 2010. Retrieved October 12, 2010. ^ "D2 Dulles Development: Concourse B Expansion" (PDF). Retrieved March 12, 2013. ^ a b Klint, Matthew. "Photo Tour: Turkish Airways Lounge Washington Dulles". ^ Kidder Smith, G. E. (2000). Source Book of American Architecture: 500 Notable Buildings from the 10th Century to the Present. New York: Princeton Architectural Press. pp. 448–449. ISBN 978-1568982540. Retrieved June 16, 2012. ^ a b c d "D2 Projects – Concourse C/D". Metropolitan Washington Airport Authority. 2011. Archived from the original on October 5, 2010. Retrieved March 12, 2013. 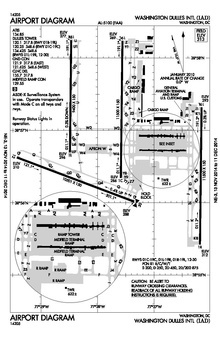 ^ a b c "Main Terminal" (PDF). Metropolitan Washington Airport Authority. July 2009. Archived from the original (PDF) on December 16, 2010. Retrieved October 12, 2010. ^ "Worldwide lounges". Qatar Airways. Retrieved April 21, 2015. ^ "Washington". Virgin Atlantic. Retrieved April 21, 2015. ^ "Online timetable". Aeroflot. Retrieved April 10, 2018. ^ "Flight Timetable". Retrieved April 10, 2018. ^ "Time Table - Air India". Retrieved April 10, 2018. ^ "Alitalia Announces Nonstop Year-Round Service Between Dulles International and Rome". Metropolitan Washington Airports Authority. November 5, 2018. Retrieved November 5, 2018. ^ "Flight Schedule". Retrieved November 5, 2018. ^ "Timetables [International Routes]". Retrieved April 10, 2018. ^ a b "Flight schedules and notifications". Retrieved April 10, 2018. ^ "Check itineraries". Retrieved April 10, 2018. ^ "Timetable | Brussels Airlines". Retrieved April 10, 2018. ^ "Flight Schedule". Retrieved April 10, 2018. ^ a b "FLIGHT SCHEDULES". Retrieved April 10, 2018. ^ "EgyptAir to launch IAD". AirlineRoute. Retrieved February 24, 2019. ^ "EgyptAir Timetable". Retrieved February 24, 2019. ^ "Ethiopian Airlines adds Abidjan – Washington Dulles service from June 2019". RoutesOnline. March 6, 2019. Retrieved March 6, 2019. ^ "Schedule - Fly Ethiopian". Retrieved April 10, 2018. ^ "Frontier". Retrieved April 10, 2018. ^ "Interactive Route Map". Retrieved April 10, 2018. ^ "Flight Schedules". Retrieved April 10, 2018. ^ "Timetable - SAS". Retrieved April 10, 2018. ^ "Flight Schedule Timetables". Retrieved April 10, 2018. ^ "Check Flight Schedules". Retrieved April 10, 2018. ^ "Sun Country to launch IAD". Retrieved January 8, 2019. ^ "TAP Air Portugal coming to O'Hare in June, with first direct flight to Lisbon". Chicago Tribune. Retrieved November 29, 2018. ^ "United Airlines Announces New Nonstop Service Between Washington, D.C. and Tel Aviv". Retrieved August 2, 2018. ^ a b "Timetable". Retrieved April 10, 2018. ^ "Interactive flight map". Retrieved April 10, 2018. ^ "Route Map". Retrieved April 10, 2018. ^ "Ethiopian Airlines Moves North American Intermediate Stop to Dublin from May 2015". Airlineroute.net. April 15, 2015. Retrieved April 17, 2015. ^ a b c "Air Traffic Statistics - June 2015" (PDF). Metropolitan Washington Airports Authority. Retrieved September 13, 2015. ^ "Airlines Serving Dulles International". Metropolitan Washington Airports Authority. Retrieved September 13, 2015. ^ "Total Operations by Airline-May 2010 – April 2011" (PDF). Metropolitan Washington Airports Authority. May 2011. Retrieved June 3, 2011. ^ "Total Passengers by Airline January 2014 - December 2014" (PDF). Metropolitan Washington Airports Authority. Retrieved August 9, 2017. ^ "Washington, DC: Dulles International (IAD)- Scheduled Services except Freight/Mail". Transtats.bts.gov. June 3, 2011. Retrieved February 9, 2017. ^ "BTS Air Carriers: T-100 International Segment (All Carriers)". Retrieved August 14, 2018. ^ "Monthly Air Traffic Summary Report". Metropolitan Washington Airport Authority. Retrieved July 8, 2015. ^ "Dulles Toll Road". Metropolitan Washington Airport Authority. Archived from the original on June 10, 2011. Retrieved June 3, 2011. ^ "Silver Line Express Bus to Metrorail Station". washfly.com. Retrieved June 3, 2016. ^ "USA: Washington DC". To and From the Airport.com. 2010. Retrieved October 12, 2010. ^ "End the Dulles Taxi Monopoly!". View from the Wing. Retrieved January 13, 2016. ^ "DC's New Rules for Uber Airport Pickups Aren't Great For Riders". DC Inno. Retrieved January 13, 2016. ^ "Dulles International Airport". Metropolitan Washington Airport Authority. 2011. Retrieved February 9, 2013. ^ Aaron, John (January 18, 2018). "Frigid weather slows Silver Line extension, completion date unchanged". WTOP-FM. ^ "Kite Rider Killed in Crash At Transpo 72 Air Show". The New York Times. May 30, 1972. ^ Tom (March 6, 2012). "Three Things You Didn't Know About Dulles Airport". Ghosts of DC. Retrieved February 17, 2019. ^ "NTSB Aviation Query NYC72AN147 N66AN". ^ "NTSB Aviation Query NYC72AN147 N7017". ^ USAF Aircraft Accidents – Life Sciences Aspects, April–June 1972. Norton AFB, California: Directorate of Aerospace Safety, Air Force Inspection and Safety Center. pp. 59–60. ^ Shaw, Adam (1977). Sound of Impact: The Legacy of TWA Flight 514. New York City: Viking Press. ISBN 0-670-65840-5. ^ a b "Safety Recommendations" (PDF). National Transportation Safety Board. November 9, 1981. Retrieved June 3, 2011. ^ "Safety Recommendation" (PDF). National Transportation Safety Board. April 3, 1995. Archived from the original (PDF) on August 26, 2009. Retrieved June 3, 2011. ^ "Flight Path Study – American Airlines Flight 77" (PDF). National Transportation Safety Board. February 19, 2002. Archived from the original (PDF) on February 27, 2008. ^ "NowData: NOAA Online Weather Data". National Oceanic and Atmospheric Administration. Retrieved February 22, 2018. ^ "Station Name: VA WASHINGTON DC DULLES AP". National Oceanic and Atmospheric Administration. Retrieved May 4, 2015. ^ "WMO Climate Normals for WASHINGTON DC/DULLES INT'L AR, VA 1961–1990". National Oceanic and Atmospheric Administration. Retrieved May 4, 2015. Mutzabaugh, Ben (January 15, 2016). "Emirates will fly A380 to D.C. after United drops Dubai route". USA Today.